We mentioned Postagram allowing us to print/mail postcards from our Instagram library. 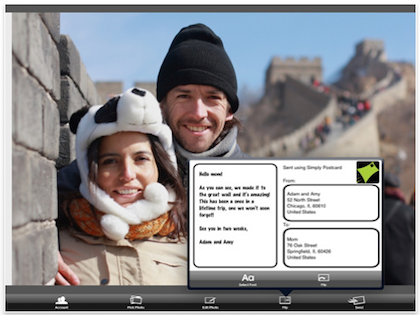 The ‘just out’ update now allows us to choose from images we have in our iPad’s Photo library. 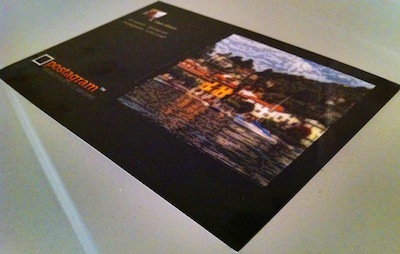 The first of the cards we have created with Postagram have been arriving. The black glossy printing is nice. There is some light scratches from the USPS machines but this is easily overlooked due to the fine quality of the overall delivered product. Using images from our library to make postcards has been getting handled by Simply Postcards. The difference between the two is Postagram, being initially an Instagram only solution does a square image using a portion of the mailed card. Simply Postcards is more along the lines of a standard postcard where the whole back of the card is an image. Both apps are free, and have associated services that do the printing/mailing for a small charge per card. Postagram charges each time you create a card while Simply Postcards offer a single and the ability to buy bundles of card printing/mailing.